If you are looking to enhance your knowledge and experience with cuisine from South America, you really should try the culinary delights from the country of Colombia. The best dishes in Colombia are not necessarily created by the finest chefs in Bogota, Cartagena or Medellin. Sometimes the finest Colombian food comes from their culturally diverse regions such as the mountainous regions of the Andes, the coastal regions of the Pacific Ocean and Caribbean Sea and of course the river basin region of the great Amazon River. One way to start a good Colombian meal is with the popular appetizer known as Aborrajados. These savory yet sweet little delights are slices of plantains that have been stuffed with the cheese of your choice, such as pepper jack to give them a little spicy kick. They are then battered and deep fried to a crispy golden brown. With the sweetness of the plantain and the slight heat of the cheese, these are a great way to start off your authentic Colombian meal. Although many native Colombians eat these for breakfast, the Carimaola is another good way to start out your dinner too. These deep-fried yucca fritters are usually torpedo shaped and stuffed with cheese or meat fillings such as shredded chicken or ground beef. The Carimaola is sometimes served with a fermented milk-based condiment known as Suero, which originated in the Caribbean coastal region of Colombia. 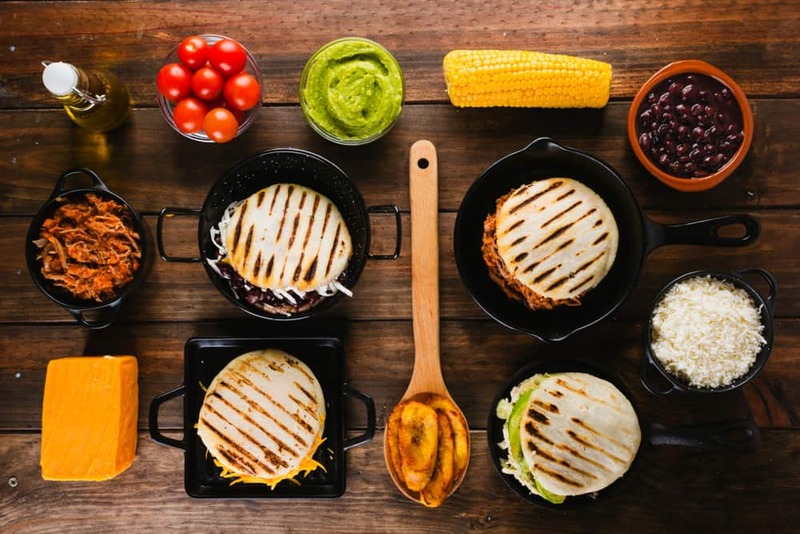 One of the most popular foods of this amazing country is Arepas. The Arepa is a pastry that is made from maize flour. It can be served with any meal be it breakfast, lunch or dinner. In the mountainous regions you may find this pastry topped with shredded chicken or goat meat. While in the coastal regions it would most likely be topped with a spicy grilled Caribbean shrimp or lobster. The Arepa also pairs well with local cheeses and fruits such as the ugly fruit, mango, guava or avocado. Because of its colder climate, one of the most popular dishes of the Colombian people living in the mountainous areas surrounding Bogota is Ajiaco, a hearty stew containing corn, chicken and three different types of potatoes, with one being the purple skinned Andean potato that is only grown in that region of the world. The chicken in Ajiaco is most often large pieces severed still on the bone and the corn included in this dish is served on the cob as well. This stew gets its unique flavor from the locally grown herb guasca and by topping the dish with Crema, a seasoned and slightly more fermented thinner form of what most people would to be sour cream. Bandeja Paisa is regarded as the national dish of Colombia. This hearty dish includes red beans, white rice, chicharrn, carne en polvo, chorizo, fried egg, ripe plantain, avocado and arepa. Back in the day, in the Andean state of Antioquia, peasant field workers would start their day with Bandeja Paisa. It was a means of providing them a full day’s worth of energy and nourishment to keep them working throughout the day. Today, the dish can actually be quite expensive because of the size of the platter (bandeja) needed to serve this huge portion of assorted Colombian food. Another chicken soup to try is Sancocho. It too includes large pieces of chicken and cob corn as well as chunks of yucca and plantains. Served in a clear broth, Sancocho is popular in all regions of Colombia and is usually served with salsa de hierbas, a spicy cream and herb sauce. If you want to try the flavors of the Pacific coastal area of Colombia, a good choice would be Sancocho de Pescado con Coco. This coconut and fish stew usually includes chunks of local fish such as Spanish mackerel or snapper. It is slow cooked in coconut milk giving this soup a creamy rich texture making more of a chowder than soup. Most Colombians like to include a side of fried plantains when serving Sancocho de Pescado con Coco. As with any Latin American cuisine, most entrees are fresh and hearty. Colombian food is no exception to this rule. One exceptional beef entre is, Posta Negra Cartagenera better known as Cartagena Black Beef. This flavorful dish using the tri-tip steak is slow cooked and then served in a syrupy, spicy and dark mole although no chocolate is incorporated into the recipe. Walk down the streets Of Cali and you’ll see them on practically every street corner. Chontaduro (Peach Palm Fruit), is one of the best-selling fruits in Colombia. While dry in taste, give it a chance, it will definitely grow on you. Especially when enjoyed with some lemon, salt, or honey. If the taste isn’t good enough reason to eat Chontaduro, how about the fact that it is very high in protein and best of all, it is known to be an aphrodisiac, hey now! Another popular beef dish you may want to try comes from the mountainous region of Santander, Colombia. This sun-dried steak known to locals as Carne Oreada. It is a thinly sliced beef steak that’s marinated in a wide range of herbs and spices and then sun-dried to a point of being similar to beef jerky. Yes, it does seem chewy as you begin to eat this dish. But when paired with boiled yuccas and a well-seasoned sauce such as pepitoria, which is a rice dish with an almond based cream sauce; you will find that the flavors will intensify with every bite you take. While there are different types of passion fruit, maracuya is definitely the most popular in Colombia, and for good reason. Yellow in color and oval shaped, maracuya is a rich source of Vitamin C and believed to aid in digestion. You can cut it in half with a sharp knife and scoop out the fruit and seeds with a spoon to eat it plain. However, you might want to sprinkle some sugar to ease the tartness. Most agree though, maracuy is best enjoyed in juices and smoothies using the pulpa de maracuya (passion fruit pulp). It also makes for a truly delicious tropical ice-cream flavor. While not very popular in North America, the Cabro Santandereano or Goat Santander Style is well received by most people of Colombia. This Colombian dish is made with marinated goat meat that has been marinated until tender, and then grilled to a smoky finish. Goat Santander is usually served with pepitoria or boiled yucca and pairs well with red and white wine. Yes, empanadas are enjoyed all throughout Latin America. However, Colombian empanadas boast an outer crust made with masarepa, which is Colombian precooked cornmeal. The typical filling is stewed beef (or pork) and potatoes seasoned with hogao. The empanadas are fried which gives them a crispy exterior, but the cornmeal pastry makes it deliciously soft on the inside. Traditionally, empanadas are served with spicy aji sauce. If you fancy seafood, perhaps you should try a nice Colombian Ceviche. Served cold, this dish contains fresh fish such as red snapper, octopus or shrimp. When marinated in lime juice the seafood “cooks” by acidity and becomes very flavorful. Most Colombians prefer their ceviche to be served with a rich tomato sauce and crackers. Because the region of Quindio is known for its trout fisheries, Trucha or trout is a favorite of the Colombian people. Trout is very versatile and can be prepared by grilling, broiling, frying or baking. Paired with local seasonings, spices and herbs it is often scored, then grilled over an open flame and served with plantains and pepitoria. If you have a sweet tooth, Colombian food has a vast amount of desserts to choose from. One such choice should always include Colombian Black Cake or as the locals call it, Torta Negra Colombiana. This rich chocolate cake is usually filled with chocolate chunks and dried papaya giving it a very distinct flavor. The frosting choices vary, but it is excellent with a nice buttercream. Another favorite dessert of this country is Roscn a ring pastry common in almost every bakery in Colombia. It is usually topped with raw sugar and filled with guava paste. Roscn is very light and airy and when paired with fresh coconut ice cream it is a great finish to any good meal. Always save room for Colombian dessert! Now that you have seen some fine examples of Colombian food, it’s time for you to explore some of the excellent food that Colombia has to offer. From its flavorful spices, seasonings and herbs, to its rich culturally influenced meat, seafood, fruit and vegetable dishes, Colombia has a little bit of everything to try and enjoy.